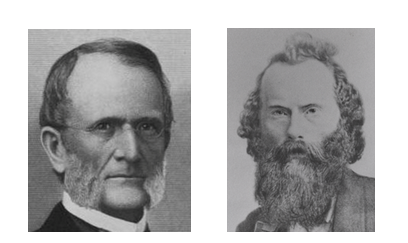 See Part IV to learn how the Cleveland Clique leveraged on John Brough to solidify its control of the Bee Line and a route to St. Louis. 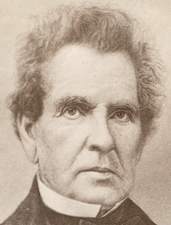 (L) John Brough, courtesy of the Ohio History Connection. (R) Henry B. Payne, courtesy of the Library of Congress. 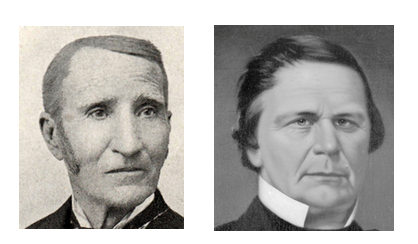 With John Brough’s election to president of the Indianapolis and Bellefontiane Railroad [I&B] on June 30, 1853, the Cleveland Clique cemented its position as the Midwest’s dominant railway cabal. 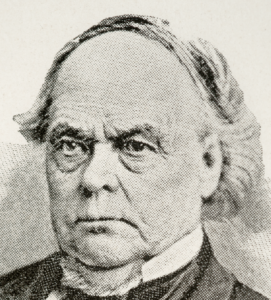 Brough’s dual roles, both there and as president of the Mississippi and Atlantic Railroad (about to initiate construction between Terre Haute and St. Louis), personified the Clique’s reach. It was also a visible sign of president Henry B Payne’s effectiveness crafting and implementing the Cleveland, Columbus and Cincinnati Railroad’s [CC&C’s] growth strategy. Now his attention turned to commanding the Bee Line component railroads and a line to St. Louis, both physically and legally. But, the Cleveland Clique’s grasp for control of the Bee Line Railroad would be elusive at best. Map of the Bee Line component lines: CC&C, B&I in red, I&B in blue; Columbus, Piqua and Indiana Railroad (CP&I) in brown, courtesy of Erin Greb Cartography. Just prior to Brough’s promotion, the I&B’s Clique-influenced board had resolved to convert its 4’ 8½” ‘standard gauge’ track (lateral dimension between rails) to the 4’ 10” ‘Ohio gauge.’ By law, the Ohio legislature had mandated that all railroads chartered there must be constructed to this dimension. As a result both Ohio legs of the Bee Line, the Bellefontaine and Indiana [B&I] and CC&C, had been built to this dictated standard. The Indiana-chartered I&B’s non-conforming gauge, however, prevented uninterrupted service between Cleveland and Indianapolis. The I&B moved carefully to implement its gauge-change resolution. This was because, in early 1852, former president Oliver H. Smith had come to terms on a through-line agreement with a rail line being built between Columbus OH and Union IN – the Columbus, Piqua and Indiana Railroad [CP&I]. When completed, this important link would provide a connection to lines extending toward Pittsburgh, and on to Philadelphia over one of the growing trunk line giants: the Pennsylvania Railroad. As part of through-line negotiations to coordinate schedules and share facilities, the CP&I had acceded to Smith’s demand that it petition Ohio’s legislature to build to the I&B’s ‘standard’ gauge. It soon received a legislative exemption and began building. However, the CP&I met financial headwinds almost immediately – most notably from the Pennsylvania Railroad, which failed to meet its guarantee commitment when the company defaulted on construction bonds. Unfortunately, following bankruptcy reorganization, the CP&I would not complete construction to Union until 1859. From the I&B’s perspective, the CP&I’s financial problems and construction delays seemed insurmountable. In contrast, the temptation to avail itself of lucrative east-west business across the combination of Ohio gauge B&I and CC&C lines proved irresistible. Under cover of a finely crafted resolution to skirt its through-line agreement with the CP&I, the I&B board resolved to lay track using the Ohio gauge as “other circumstances and relations for the welfare of the Road may require.” Under this guise, by the summer of 1853, it had re-laid track between Union and Muncie to the “Ohio gauge”. Given this developing situation, the CP&I felt compelled to act. It successfully sought a preliminary injunction to block further track/gauge conversion. The Bee Line was effectively stymied in its effort to achieve a uniform gauge run from Cleveland to Indianapolis. 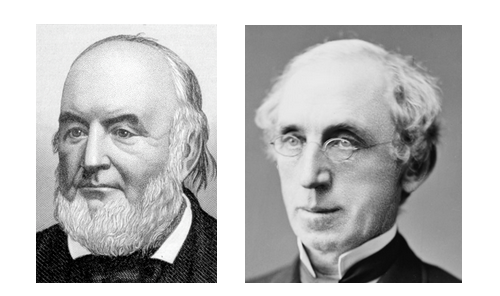 Although the I&B argued the 1852 through-line agreement was silent on the CP&I’s track conversion accord, Smith’s apparent sidebar pact proved compelling to the court. 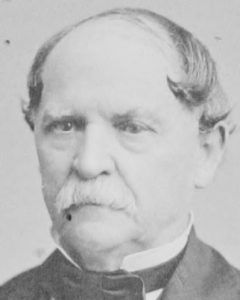 I&B president John Brough, backed by a new board replete with Clique members, was directed to move decisively to resolve the problem in late summer 1853. It proved to be a particularly costly settlement. Together, all component roads of the Bee Line agreed to guarantee the CP&I’s performance on $400,000 of bonds issued to complete the road to Union. Beyond eventually finding themselves on the hook for this issue, the Bee Line roads would provide another, and then another tranche of funding by the time the CP&I limped into Union in 1859. At least the I&B could now finish its Ohio gauge track conversion between Muncie and Indianapolis. And, under terms of the settlement, the CP&I also re-laid its track to the Ohio gauge. Winding up the CP&I lawsuit had been a prerequisite to inking a Cleveland Clique-initiated through-line agreement among all Bee Line component roads. The day after securing the CP&I settlement, the Bee Line’s through-line agreement was signed. There were two telling provisions that spoke to the different vantage point of the Cleveland Clique and Hoosier Partisans. Map of the Bee Line component railroad: I&B, B&I in blue, CC&C in red; lines to Pittsburgh in brown: CP&I to S&I/P&S, O&P, courtesy of Erin Greb Cartography. As to the latter clause, it would be easier for the Cleveland Clique to do its bidding if the Hoosier Partisans’ influence was diluted in a newly constituted board. At the same time, combining the two lines could prevent the Partisans from cutting their own agreement with the CP&I to carry traffic back and forth to Columbus and toward Pittsburgh via Union – totally avoiding carriage over the B&I and CC&C. And there was also a second option to reach Pittsburgh, via the Ohio and Pennsylvania Railroad (O&P) – passing near the B&I’s eastern terminus at Galion OH. Still, at the time, the Clique’s consolidation mandate only served to draw the two smaller lines more closely together in their common struggle for independent decision-making. As unfolded for the Cleveland Clique, however, its consolidation directive would not be accomplished easily or quickly. Squirming under the Clique’s dictate, and recognizing its strategic position as the funnel for rail traffic to and from Indianapolis to either Cleveland (and New York) or Pittsburgh (and Philadelphia), the I&B board served up its own subtle message. Essentially touting its option to bypass Cleveland through separate links to Pittsburgh, Hoosier Partisan David Kilgore proposed a name change “from and after the first day of February 1855. . . . The said Corporation shall be known by the name and style of the ‘Indianapolis, Pittsburgh and Cleveland Railroad Company’ [IP&C].” It was overwhelmingly adopted. The name change really symbolized much more. The locally controlled and focused I&B railroad era was gone. The newly rechristened road would now test its wings as a regional player—hoping, like a teenager seeking freedom from parental control, to stand apart from the clearly parental CC&C. Map of the proposed route of the Mississippi and Atlantic Railroad. Excerpt from “Map of the Bellefontaine and Indiana Railroad and connecting lines” (W. Milnor Roberts, Chief Engineer: 1852). Courtesy of the Library of Congress. Separately, in 1854, John Brough was ramping up his Mississippi and Atlantic Railroad [M&A] – destined to link Terre Haute and St. Louis. After an arduous legal effort to validate its claim to an Illinois charter, the M&A had prevailed against Chicago and Mississippi River town political interests earlier in the year. However, it would soon be faced with another trumped-up legal challenge and a concerted public relations effort to undermine its viability and management capabilities. Such obstacles were having a detrimental effect on Wall Street investors. In March 1854 a legal opinion by Abraham Lincoln’s Illinois law office asserted the illegality of the M&A’s corporate existence. Then, a New York newspaper article questioned Brough’s managerial track record at the Madison and Indianapolis Railroad. The investor community was beginning to shy away from the M&A. Nonetheless, with short-term funding secured, Brough pressed on with the M&A’s building phase. He issued a marketing circular and let contracts for the whole line by May, announcing the line would be completed by the summer of 1856. Brough would spend an increasing amount of time on this effort as 1854 wound down. James F. D. Lanier, Sketch of the Life of J. F. D. Lanier, self-published, 1877. Even though Brough was dealing with M&A matters full time beginning in mid-February 1855, the concerted efforts of powerful Chicago and Mississippi River town political interests had swept away investor confidence. James F. D. Lanier, the M&A’s financier through the Wall Street firm that bore his name – Winslow, Lanier & Co. – decided to take desperate action. On May 20th the M&A board, controlled by Lanier, demoted Brough to Vice President in favor of Chauncey Rose. Rose, founder of the Terre Haute and Richmond Railroad linking Indianapolis with Terre Haute, assumed the presidential mantle. In spite of his impeccable reputation as a railroad executive, Rose’s presence failed to sway the investor community. 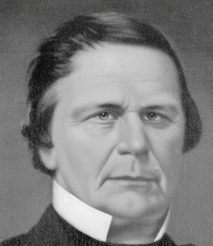 John Brough would not live to see the Mississippi and Atlantic Railroad completed to St. Louis. And, more to the point, how would the Cleveland Clique view Brough as their pawn in its broader Midwest railroad control strategy? Check back for Part VI to learn more about the Hoosier Partisans move for autonomy as the Cleveland Clique tightened its grip on the Bee Line Railroad. See Part III to learn about how the Bee Line and other Midwest railroads reset, and sought to accomplish, their goal – to reach St. Louis. Top: Map of the Bee Line component railroads. Bottom: Map of the proposed route of the Mississippi and Atlantic Railroad (both excerpts from “Map of the Bellefontaine and Indiana Railroad and connecting lines,” 1852, courtesy of the Library of Congress). With John Brough’s elevation to the presidency of the Bee Line’s Indianapolis and Bellefontaine Railroad [I&B] segment – between Indianapolis and Union – on June 30, 1853, the Cleveland Clique was understandably euphoric. Brough’s newly arranged presidential authority there and at the Mississippi and Atlantic Railroad [M&A], about to begin construction between Terre Haute and St. Louis, personified the Clique’s growing regional dominance. By all appearances they, through the Cleveland, Columbus and Cincinnati Railroad (CC&C) and president Henry B. Payne, would soon control the key Midwest rail corridor linking the East Coast and the West. At the same time, the closer-to-home Bellefontaine and Indiana [B&I] – linking the I&B at Union with the Clique’s marquee railway, the CC&C, at Galion OH – had already found itself under the financial sway of the Cleveland band. Incredibly, the strategy to command a string of railroads tying St. Louis to the Eastern truck lines then breaching Ohio’s eastern boundary had been orchestrated by the CC&C’s Henry Payne in little more than two years. In the almost giddy atmosphere that prevailed following John Brough’s coronation, an impromptu trip was arranged. Why not visit Terre Haute, and the Illinois state line for that matter, and then travel in a single day from Terre Haute to Cleveland? 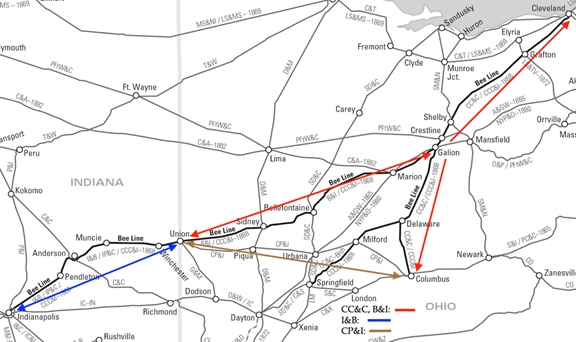 It would underscore what the Clique had accomplished, provide an on-the-ground view of the new western terminus of the coordinated lines, and draw them closer to the independently minded stockholder/management team at the controls of the Terre Haute and Richmond Railroad [TH&R] – the only gap in the Clique’s string of pearls between Cleveland and St. Louis. (L) James H. Godman, courtesy of the Marion (Ohio) County Historical Society (R) Calvin Fletcher, courtesy of the Indiana Historical Society. Members of the Cleveland Clique along with president James H. Godman of the B&I, newly minted I&B president John Brough as well as board member Calvin Fletcher and secretary Douglass Maguire boarded a special train destined for Terre Haute on July 1st. It had been less than twenty-four hours since the Clique’s I&B annual meeting coup. None of the original I&B Hoosier board members went along for the ride. In one respect the trip was a success. They drank brandy and wine with Samuel Crawford, president of the TH&R, supped together and made it to a symbolic bridge spanning the Wabash—peering across wide stretches of western Indiana farmland toward Illinois. Truman P. Handy and William Case, board members of the Cleveland Clique’s cornerstone CC&C railroad, continued on to the Illinois line by horse and returned to Terre Haute by 3 a.m. Now they could boast of having made it from the Illinois line to Cleveland in a single day. (L) Truman P. Handy, Biographical Cyclopedia and Portrait Gallery of the State of Ohio, Vol 2. (Cincinnati: John C Yorston & Co, 1880). (R) William Case, courtesy of Cleveland Public Library. A private train left Terre Haute before dawn on July 2nd. It ran at a blistering thirty miles per hour until hitting a cow near Belleville—knocking the engine and car off the track. It was a near-death experience, as Calvin Fletcher recounted. Still, they were in Indianapolis by 6:30 a.m.
Fletcher did not record whether they accomplished the lofty goal of making it to Cleveland that day, as he remained in Indianapolis. All the same, except for the lack of participation by original I&B board members, it had been a notable start to John Brough’s presidency – and provided a glimpse of the Clique’s mechanism for expansion. The Hoosier Partisan’s absence would prove to be a telling sign of issues looming ahead. 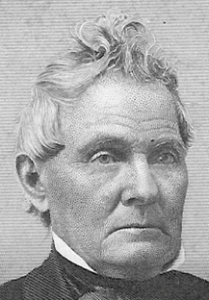 (L) Daniel Yandes, courtesy of the Indiana Historical Society. (M) David Kilgore, author’s personal collection. (R) Thomas A. Morris, courtesy of the Indiana Historical Society. Hoosier Partisans Alfred Harrison, Daniel Yandes and David Kilgore as well as ubiquitous Indiana railroad construction engineer and soon to be I&B board member Thomas A. Morris were among the throng. They all boarded a special train awaiting them in Indianapolis on the morning of July 20th. In his diary, Calvin Fletcher would capture both the spectacle of the excursion and the travails of travel during this era. 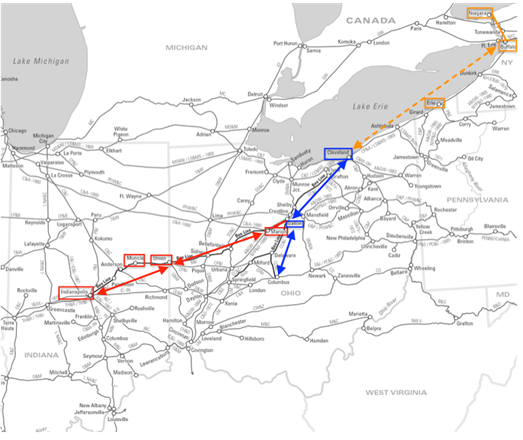 Map of Cleveland Clique junket from Indianapolis to Niagara Falls, over the Indianapolis and Bellefontaine, Bellefontaine and Indiana (both in red), Cleveland, Columbus and Cincinnati (blue), by ship to Buffalo (orange dash), and rail to Niagara Falls (orange). Cities visited in colored rectangles. Courtesy of Erin Greb Cartogarphy. The conductor to Union was none other than Fletcher’s recently hired son Stoughton Jr., who helped the party around a derailed freight train along the way. They arrived at Union about 10:30 a.m. Connection delays added to a tardiness that precluded the Hoosier contingent from stopping at Marion, Ohio, for a B&I board–arranged dinner. Instead, they raced on to Galion to connect with CC&C cars coming from Columbus. The crowd reached Cleveland at 7:30 p.m., only to find the boat hired to take the assembled masses to Buffalo had broken down. Because the politicians of Erie, Pennsylvania had made smooth rail travel between Cleveland and Buffalo nearly impossible during the early 1850s, going by this route was not a viable option. 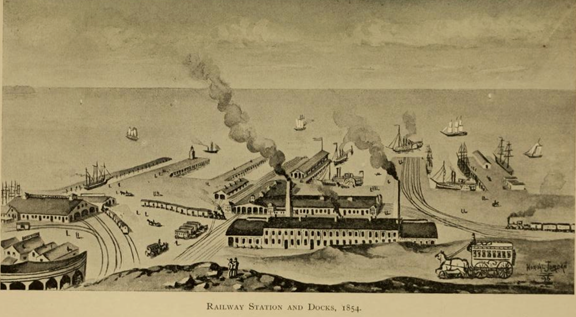 To force passengers and freight to overnight in Erie, city fathers had mandated different track ‘gauges’ (the lateral distance between iron rails) for railways entering/leaving the city from the east and west. The Erie “war of the gauges”, in combination with intentionally and poorly synchronized railroad schedules, wreaked havoc on passengers and shippers alike. Erie thrived on this senselessness until 1855, during which time near-riots by local merchants and warehouse workers nearly scuttled a move to finally synchronize schedules and re-lay rails to a uniform gauge. It was midnight before more than 750 passengers stranded in Cleveland boarded a replacement vessel to Buffalo – arriving the next day at noon. 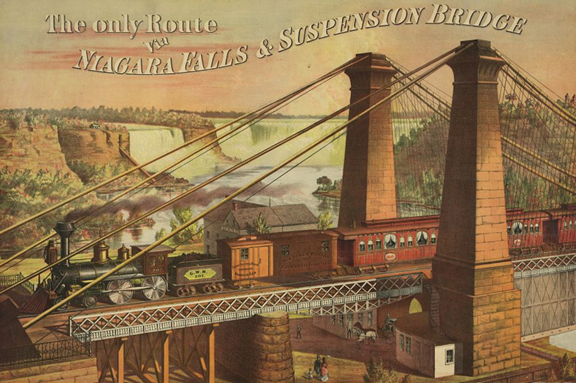 There, a train of nearly fifteen cars met the ship and whisked its guests the final miles to Niagara Falls. They took in the falls and were awestruck by the engineering feat of the recently completed railway suspension bridge traversing the Niagara River. The revelers were then ferried behind the tumultuous sheets of water before dinner and a moonlit trip to Goat Island. The excursion lasted less than twenty-four hours. On the return boat trip to Cleveland the assembled guests lunched, ironically, at Erie, Pennsylvania. Postcard image of the Suspension Bridge across Niagara Falls circa 1876, courtesy of the Library of Congress. That evening Cleveland’s mayor hosted what Fletcher referred to as a “soirée” of dinner, music, and speeches. He called it “a most splendid affair that I ever witnessed.” As might have been expected, newspaper editors and writers had been invited gratis. They clearly earned their passage by publishing effusive articles in the regional and national press. The editor of the Indianapolis-based Locomotive gushed: “We have never taken an excursion with which we were so well pleased. Every arrangement was made in princely style for the accommodation of the invited guests; and everything free as air, from our railroad bills down to our omnibus bills, including hotels and everything necessary.” It had proved to be the most incredible public relations feat of its day. Finally, on the return leg from Cleveland to Indianapolis, the B&I board hosted the earlier-deferred dinner party at Marion, Ohio. Toasts were exchanged, a “three cheers” shouted, and the Hoosiers were off to Union the next morning. There they waited an hour for connecting passengers coming from Cincinnati. Exhausted, the entourage supped at Muncie and finally arrived back in Indianapolis by 11 p.m. Still, for the people of the era, it had been both an awe-inspiring event and a technological marvel. To the parochial Hoosier Partisans, it brought home the sobering reality that the Cleveland Clique outgunned them financially and politically. The sheer number of interconnected board, business, banking, and government relationships represented at the Cleveland festivities was astounding. And they had gathered with a single purpose: to focus their wide-ranging powers on dominating the Midwest rail corridor between Cleveland and St. Louis. Fletcher’s unemotional view was sprinkled with a candid and ominous reality, however: “Brough the president has failed to establish his right to go through to St. Louis straight. This I think will effect [sic] the road materially.” And he was right. Whatever the reason for the I&B’s price bounce, it did not reflect the financial or business reality with which John Brough and the Cleveland Clique were faced. Brough’s usefulness to the Cleveland Clique appeared, for the moment, to be in question. Check back for Part V to learn more about how the Cleveland Clique turned their attention to binding the various component parts of the Bee Line together both physically and legally – to the irritation of the Hoosier Partisans.